Meet the friendly staff at West Miami Animal Hospital! Dr. Cristian Perales is the Medical Director of West Miami Animal Hospital. 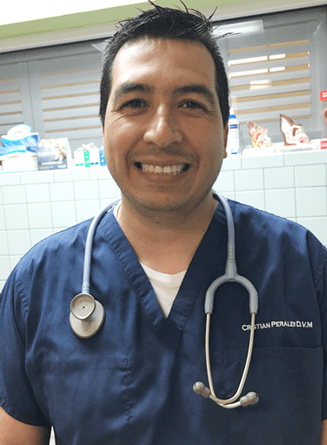 In 1998 he earned his degree in Veterinary Medicine from the University of Concepcion in Chile and has been working in the U.S. as a Veterinarian since 2009. Dr. Perales chose to enter the field of Veterinary Medicine because of his devotion to help sick animals. For 7 years Dr. Perales received special training alongside board certified surgeons, as well as special training in veterinary dentistry. He is a member of the SFVMA and the AVMA. Dr. Perales’ main interest of Veterinary medicine is surgery and dentistry. What he considers to be his favorite aspect with working at West Miami Animal Hospital is being able to work with a great team that knows how to provide good, quality service. The most rewarding part of his job is being able to see his patients reach a full recovery. He very much values the appreciation and gratitude he receives from their owners.